Using the Rotate command, I successively “walked” the back piece up the front. I rotated the back a bit until it aligned with the front seam, then picked a new rotation pivot point at the new place where they started to diverge. 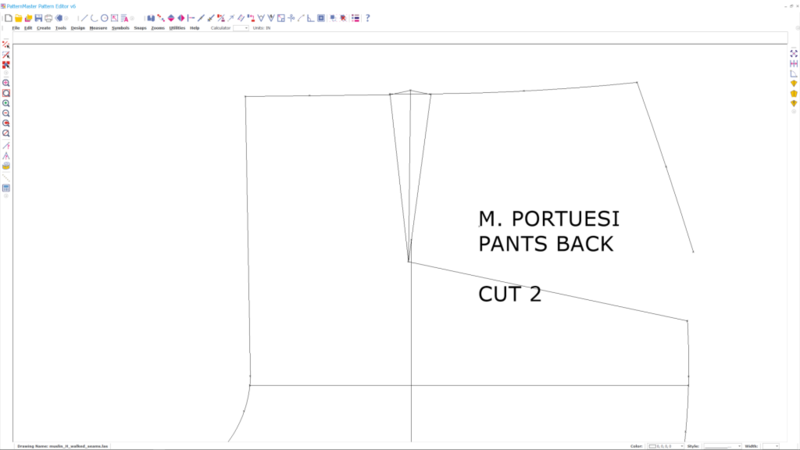 Repeating this process, I eventually reached the end of the seam – where the front and back crotch curves intersect. 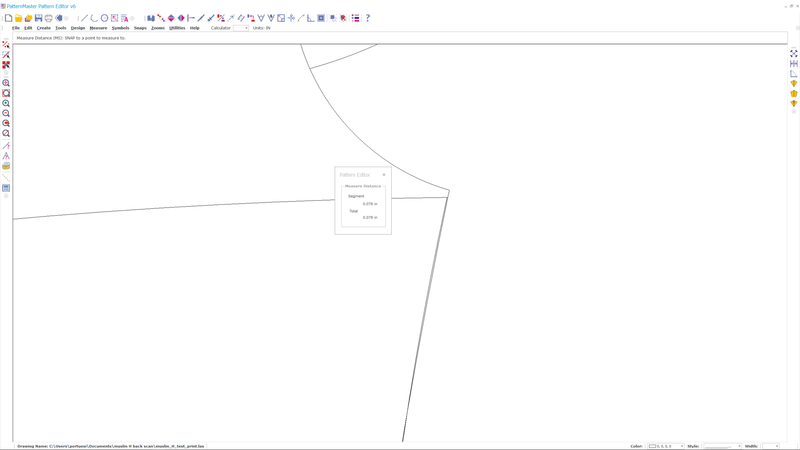 I zoomed in, and used Pattern Editor’s Measure tool to find out the back piece is ever-so-slightly shorter than the front – in this case somewhere between 1/16 and 1/8 of an inch. I walked the side seams and found nearly the same discrepancy. 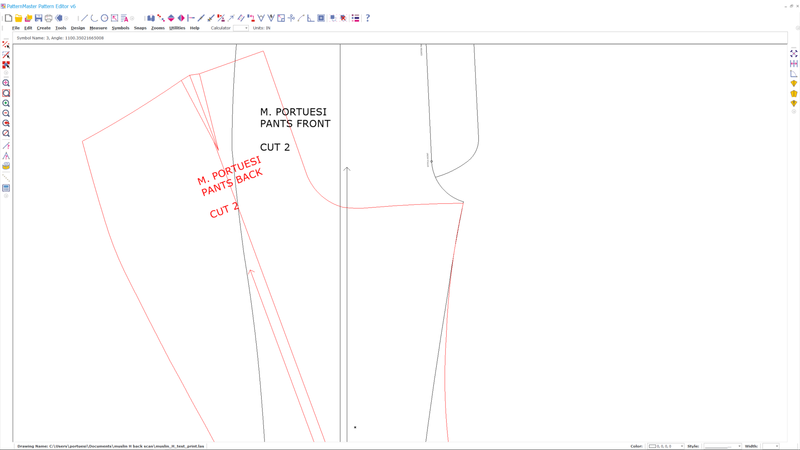 So I added that amount to the bottom hem on the back piece and got a very good agreement between front and back seams. In my last article, I drafted a contoured waistband from the front and back pieces using Pattern Editor’s Offset tool. But I forgot to tell you how I dealt with the dart in the back piece. Let’s start with the back piece, containing that pesky dart. 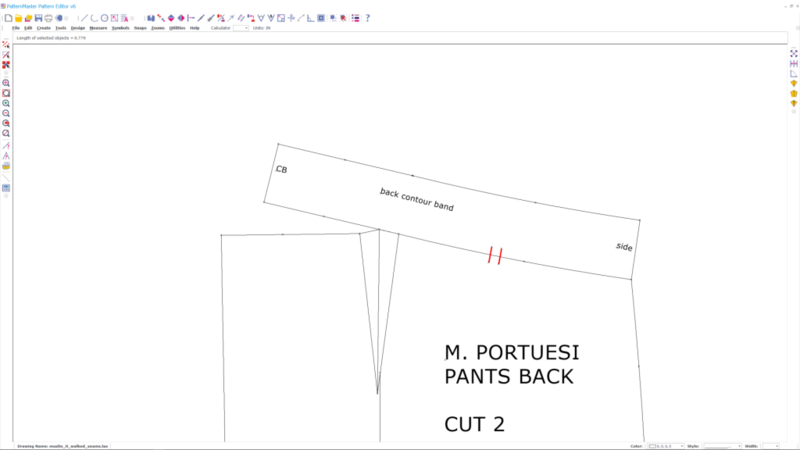 I used Pattern Editor’s Dart Transfer command to transfer the dart to the side seam of the pant, just to get it out of the way of the waistband. Dart Transfer automatically rotated the top and side seams to close the dart at top, and opened a gap for the new dart on the side seam. 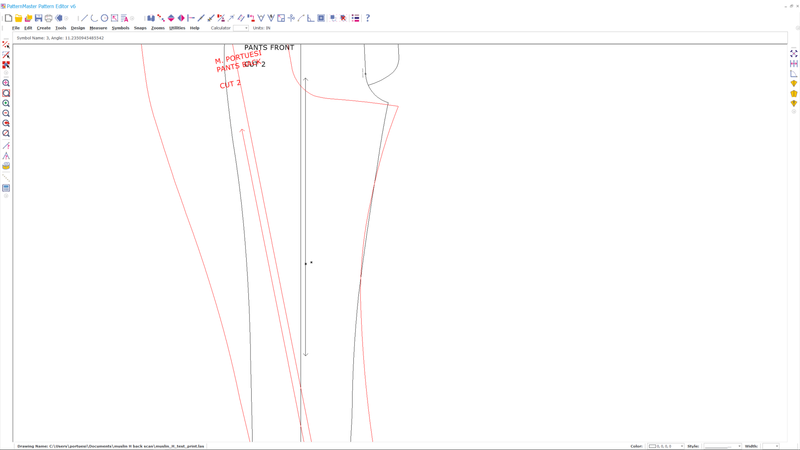 Pattern Editor requires you to work a little to clean up the old dart and draw legs for the new. Here’s the waistline with the dart removed. You can see a slight mismatch now where the dart was; that’s easy to true off to make a clean waistline using the Move Point command. 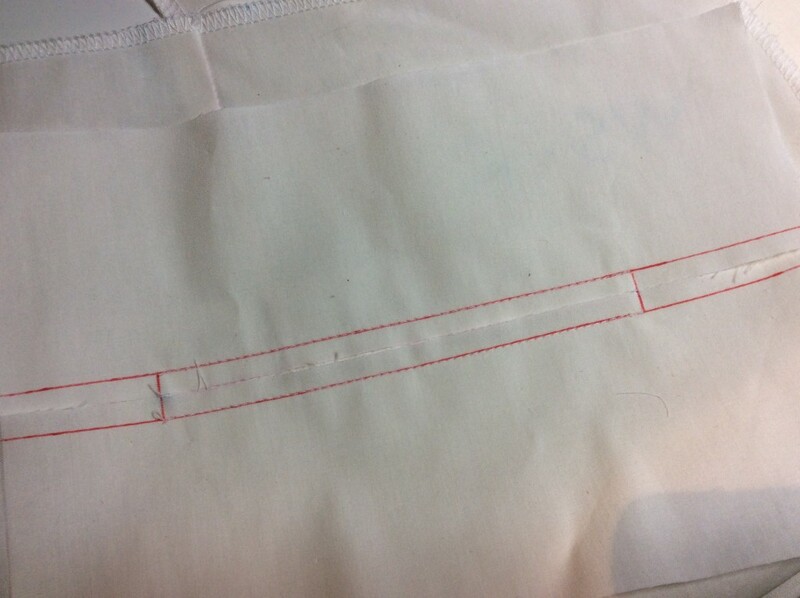 Once cleaned, the curve can be cloned and used as the bottom seam line of a waistband piece. 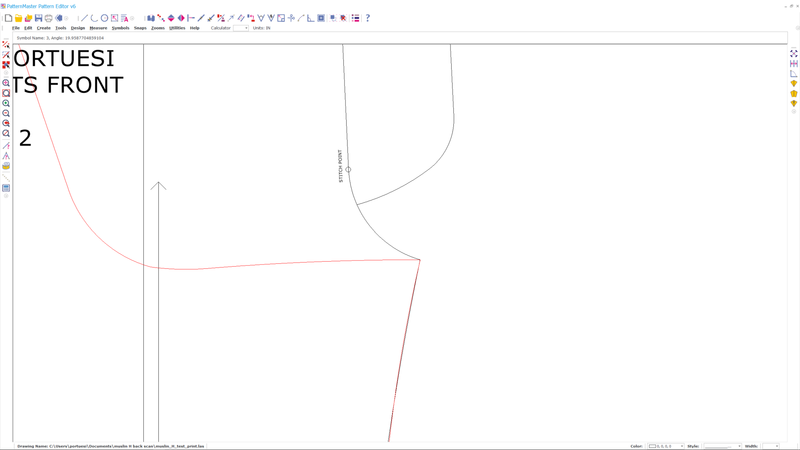 After completing the back contour band piece, I aligned it back to the original back piece, so that I could add pattern notches (in red) to both. I decided to make one last trial garment with actual muslin fabric. I wanted to test my new waist band, as well as try out welt pockets in the back. 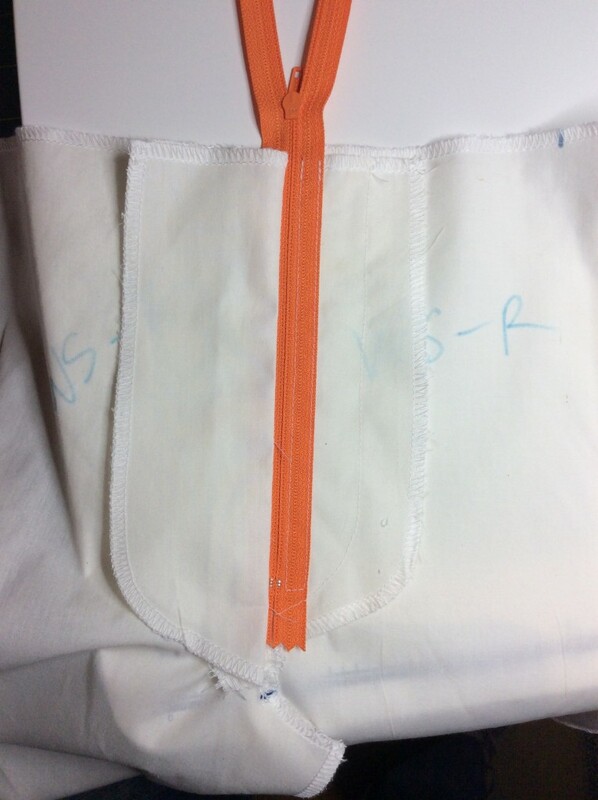 Finally, I wanted to create a fly zipper opening following David Coffin’s instructions, so I could make mistakes in muslin rather than actual fabric. I chose not to include front slash pockets. The facings for a front slash pocket incorporate the side seam curve, and I still don’t have the side seam dialed in correctly for fit. So I didn’t want to have to redraft my facings. Otherwise, this muslin was very much like a real pair of pants. 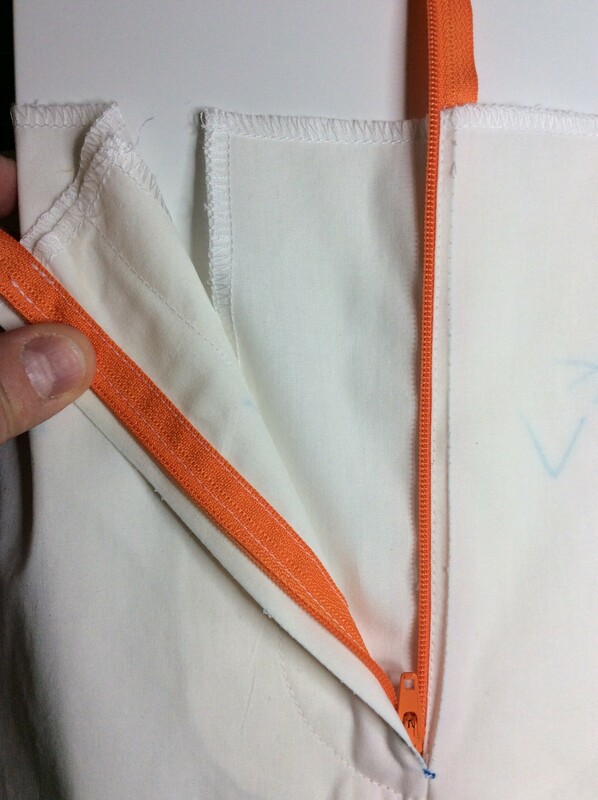 Welt pockets are little bit of a thing in the men’s sewing blog community lately. 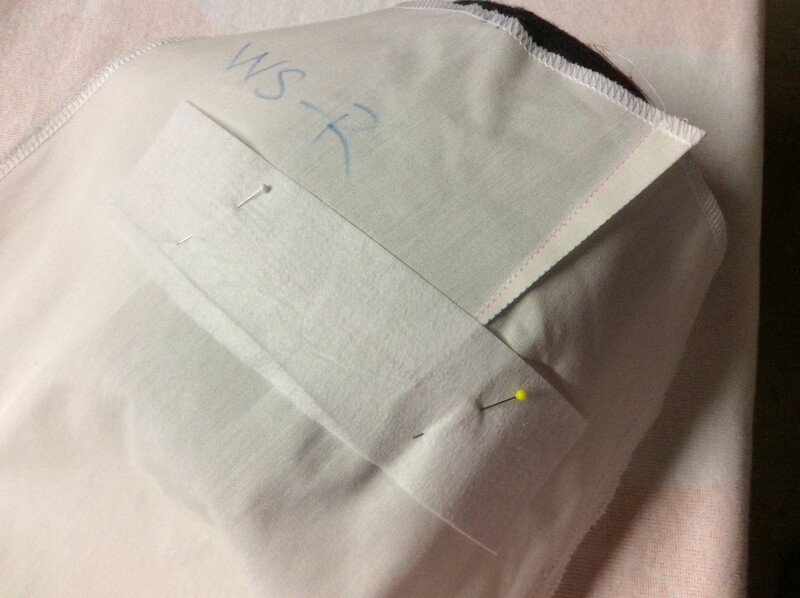 While working on this project, Wil at Thin Man Sewing stitched together his own welt pockets for a pants project he’s working on. He followed a very well done YouTube video on the subject; I’m following David Coffin’s method, as shown in his book Making Trousers and in his Craftsy Class, Pant Construction Techniques. Here are the welts are applied to the right side, before slashing and turning. One difference between Coffin’s method and the one Wil used is that I folded and shaped the welts after stitching and turning, rather than before. But the two methods are very similar. Putting together welts with stuff muslin fabric was a bit of a challenge. The right welt turned out better than the left. I’m not happy with the finished results, especially on the sides which aren’t perfectly square and show raw edges. And the welts are kind of droopy. Ah, well – practice makes perfect. I built a fly zipper, again following instructions in Making Trousers. DPC also covers the technique in his Craftsy class. I choose to use his Option A, a method of constructing the fly that involves stitching in a separate fabric fly shield. I made two big mistakes. I followed Coffin’s photos in the book literally, and wound up with a fly that overlaps right on left – great for a woman’s garment, but not suitable for menswear. Finally, I carelessly yanked the zipper pull off the end of the zipper before I attached the waistband. Fearing the project ruined, I searched YouTube in desperation and found this video which shows you how to reattach the zipper pull to a closed zipper. Project saved. I’m going to spare you yet more photos of me posing in muslin pants. I’m sick of them too. I do have photos, but they turned out blurry and I won’t reshoot them to include here. But as I expected, the side seams still are a bit of a problem. They continue to open up a bit below the widest part of my hip, and aren’t giving enough ease around the area where my hip is widest. 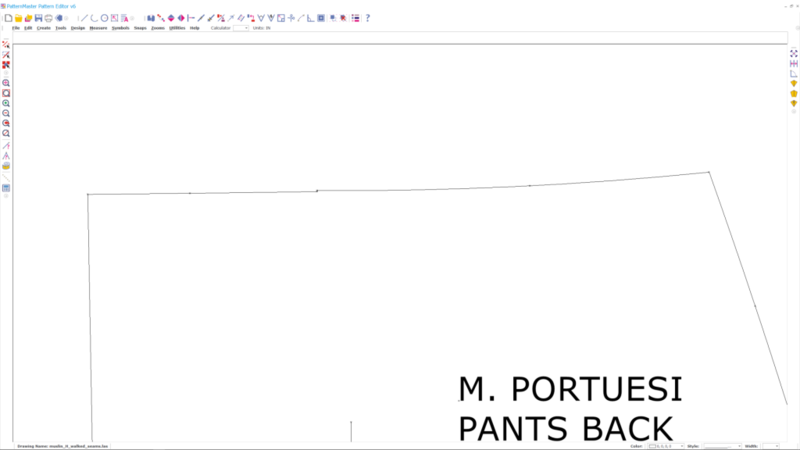 I’ll update and print the “final” pattern for a wearable muslin, including adding front slash pockets. Can’t wait to see your finished project. This has been an epic journey, and I admire your ” stick-to-it-ism”!!!! Here’s a little tid bit from Roberto Cabrera concerning double welt pockets. 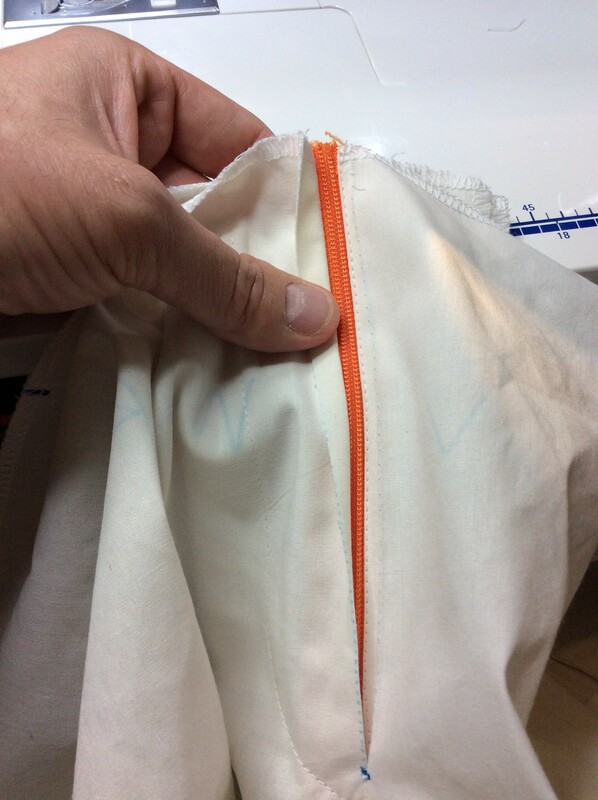 To prevent the pocket from sagging the welt should be basted on in a slight downward curve, say 1/8″. Hopefully this will help. 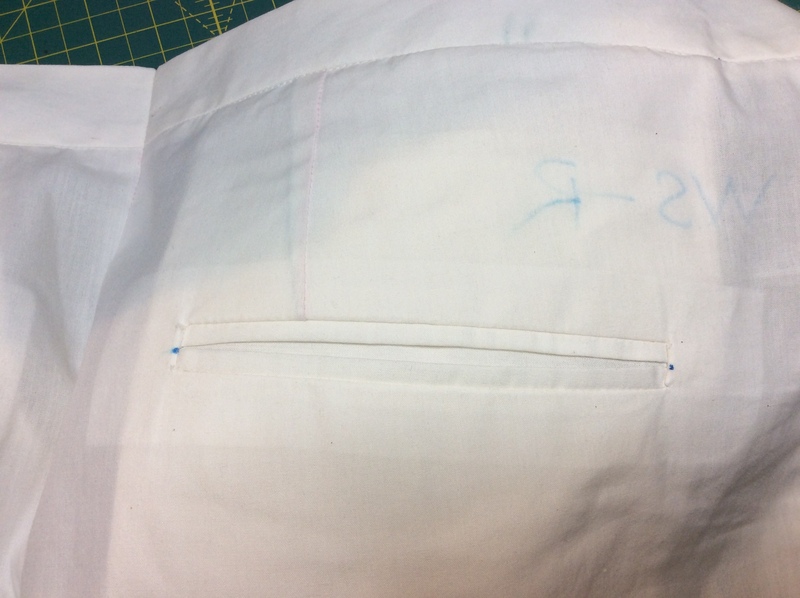 It’s too late for the wearable muslin – I put in straight welts, which you’ll see in my next blog post – but the slightly curved welt sounds like a good thing to try for the next project. Great looking welts ARE a challenge, especially 4 of them (2×2)! I’ve been generally defaulting to single welts myself, since there’s nothing to match and half the effort/time required, but regardless, muslin’s never going to be the best stuff to show them off; too flimsy to support such a complex structure, IMO. You’re right of course about the difference you mention, but I watched that video and only spotted ONE thing that was at all similar: We both cut the opening the same way! Every other step, as well as the basic result (how the pocketing is added, where the topstitching goes, how the seam allowances are handled, how the bag is finished, what the inside finishing looks like, etc. ), is strikingly different between the two methods. Not nec. better, either one—both result in perfectly serviceable pockets with double welts and one doesn’t seem obviously more efficient, easier, less conventional or quicker than the other. But since both the steps and the finished results are noticeably not the same at virtually every point, I’d say the two methods provide a classic case study in how differently, yet successfully, apparently similar goals can be approached. And these two ways are hardly the end of the welt story! No doubt some will find my reaction extreme, if not sheer nit-picking. But I feel there’s so much to be discovered (about the structures themselves, as well as about our own preferences and current skills) from dissecting, comparing and testing out many different ways of building such basic structures as pockets, etc., that I felt compelled to comment on how NOT similar I find them. I’m writing a narrative for this blog article, but I’m leaving some things out. Wild Ginger is pretty awesome, but it’s not perfect. I’ve encountered several glitches, and there are some things about the program that are just plain klunky. For instance, it doesn’t have an “Open Recent” option on its menu. It seems like a small thing until you have to dig through a file chooser for the umpteenth time to locate the document you previously were working on. 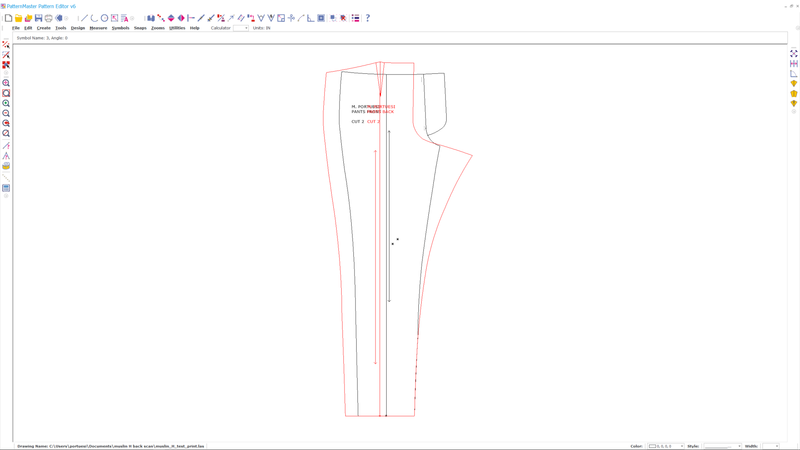 I should write a full review of Wild Ginger, but I feel that it wouldn’t be fair because I’m not even touching the Style Editor portion of the program that drafts patterns from measurements – and that is the signature feature Wild Ginger promotes for their product. You’re right of course about the difference you mention, but I watched that video and only spotted ONE thing that was at all similar: We both cut the opening the same way! It’s not the only difference – it’s the first one I noticed, but there are others. Comparing the two methods for making welts could be the subject of its own article, but you could say that I downplayed the differences between them. A bigger difference is the way the welt is anchored to the pocketing. Your method stitches down the pocket bag and welts in the inside seam allowances, the YouTube video has you topstitch/edgestitch around the border of the welt. Your method produces a very clean welt on the outside; the YouTube method has visible topstitching which might be the look you’re going for. I’m exceedingly unlikely to ever get down with running Windows on my Macs, but I DO love software tools, have WAY too many, and am willing to put up with and work around quite a lot for the sake of just a few cool features…and that seam-length-compare thing made my nostrils flare and eyebrows wiggle:) Re: no Open Recent…, can you keep some sort of system-wide track of recent docs, and open them rather than the software first? I think anybody who’s made a serious effort to do real work with any software tool, no matter how few or many of the software’s features were invoked, is entitled to write about, and worth listening to about, how good the tool is. And I look forward to all your future comments and reflections on WG. Thanks for being reasonable about my rant on welt methods; I guess I’m a sort of method collector and thrive on noting every little distinction. But I DO find that really coming to satisfying terms with sewing—and enjoying the results—is all about this level of distinction, for me at least. It’s always seemed to boil down to this (again, for me): There’s always lots of different ways to do almost everything you can imagine in sewing, and none is inherently better than another, in the sense that ALL methods can be done skillfully. But there’s almost always little detail differences in the final results, and for some, these differences are more important than for others. As for ME, they usually make ALL the difference:) EG. 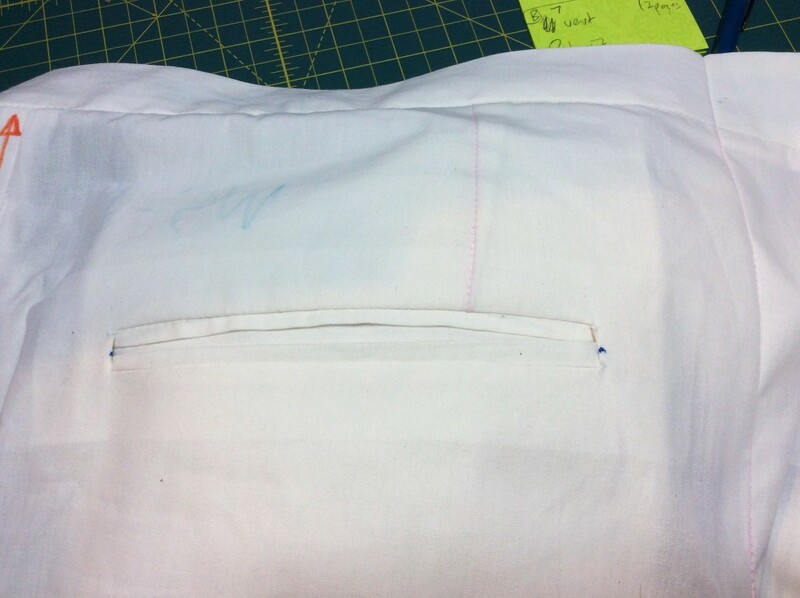 : Is the topstitching visible, and how are the seam allowances pressed on welts? The answers, naturally, can all be right, depending on the project goals. And then, of course, there’s WRITING about it all:) Can’t resist! Thanks for providing such an interesting platform for that. Re: no Open Recent…, can you keep some sort of system-wide track of recent docs, and open them rather than the software first? This leads into one of Pattern Editor’s glitches – if you double-click on a document icon, Pattern Editor loads, but it thinks it is running in “unregistered” mode and immediately loads a demo pattern, rather than the document you clicked. The only reliable way to load documents is to launch Pattern Editor from the Wild Ginger opening screen, THEN open the document in the editor. I’m meaning to start filing bug reports with Wild Ginger. Their customer support (I tried while evaluating the app pre-purchase) is very responsive – I even got replies over the fourth-of-July weekend – but I also got very curt one-line replies. I will ultimately write a detailed review of the program, but I’ll qualify it by saying it’s only the Pattern Editor portion. I have a unique perspective, as I’m a software developer in my day job and so can offer a professionally informed take on the product. I went back and read what I wrote; I did say they were “very similar”. So I did downplay the differences. Again, it was a clumsy effort to streamline the narrative. I’ve chosen to concentrate on your methods, because I’ve always been impressed with “Making Trousers” and wanted to work with the techniques you’ve laid out in your book. But it would be fun to try out both methods and compare. For example, would the welts really turn out better if I pressed them before stitching them in place? For me it boils down to budgeting the time I have to spend on sewing projects. Thank you very much for the compliment. I appreciate it. Oh, yes: I DO hope you’re someday going to test out WG’s trouser drafting smarts; should be fascinating after all you’ve been doing/learning. I will probably get involved with Style Editor at some point. It does want you to sew a trial muslin, then tweak the settings in your fitting profile. Really, I am all muslin-ed out at this point and would like to get some more garments cranked out before going back to muslin fitting. Sometime in the near future I’m going to be cloning some shirts I just purchased from Brooks Brothers – one is their “Madison”, or regular fit, and the other is their “Regent”, or slim fit. I want to clone them before running them through the laundry to avoid the effects of shrinkage, but I also want to wear them! So I’m motivated to do that soon. I admire your tenacity with this project. I am glad you found a way to re-attached the zipper. Yes, youtube is a great resource. I found another method to fix a stuck zipper teeth. Silicon spray, spray and let is set for a while(just in case). Invisible zippers are famous for getting stuck. Anywho, welt pockets… humm! maybe one of this days. YouTube is a great resource, but I have to be discriminating; sometimes the videos are by people who aren’t necessarily qualified to teach the technique. “You show them who is the boss” – LOL. I started this project over a YEAR ago! I think the pants know who’s the real boss. As always, Josie, thanks for following along. I learn a lot reading your blog. I chose the welt pocket tutorial based on the fact the “welts” were made separately and sewn on the pocket, whereas in the other tutorials the “welts” were folded into place and sewn. I felt for a novice like me I would have more control with the method I chose. Not that I thought one made a better pocket. Yes, Wil – my first thought when I saw that video, having just made those welts pictured above, is that pressing out the welt before you stitch it in makes forming a crisp, even fold easy to do. But after thinking about it some more, I wondered if it meant that you had to exercise more care in getting the welts to run directly through the center of the opening – it’s the same problem I have putting in zippers. With DPC’s method, you take care of getting the welts aligned at the same time you fold them. I really do need to try out both approaches and see which one I like better. The ones you posted on your blog do look good, though – congratulations on your effort! First, I admire your persistence on this project. You have worked so hard on these pants. You should take all your learning experiences and publish a book at this point. I am sure that your collective experience would benefit many home sewers. I am looking forward to seeing your final result. 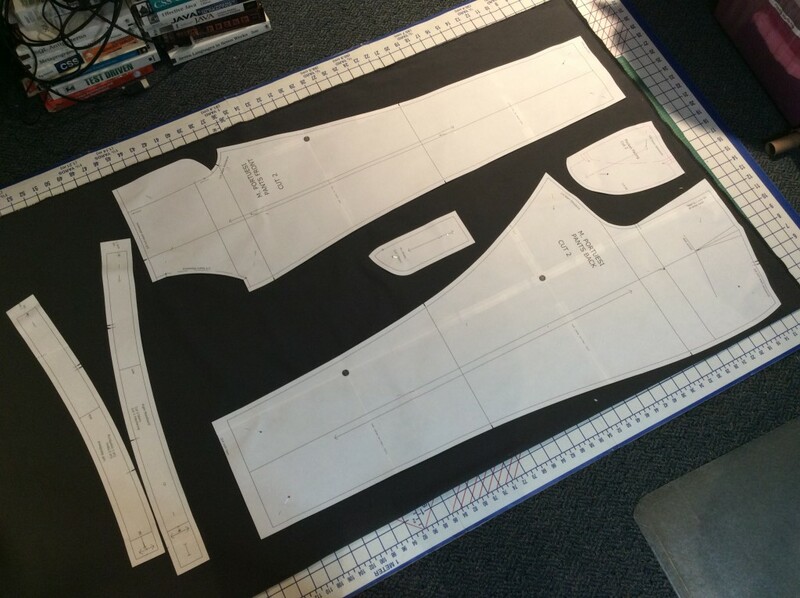 I am sure you will finally have a trouser pattern that you can make all sorts of variations and have learning more then anyone taking a fashion course on pattern making. I very much appreciate your suggestion that I should publish a book. Everything I do here may all be building to something bigger but I’m not sure what. In the meantime I’m enjoying the experience of learning new things, and sharing what I learn. Those pesky welt pockets, I’ve made lots of welt pockets over the years, and I like to fold and press my welts before inserting them. I usually interface them, so after folding and pressing they have a crisp finish. There is no substitute for precise marking and measuring, and equally precise stitching. 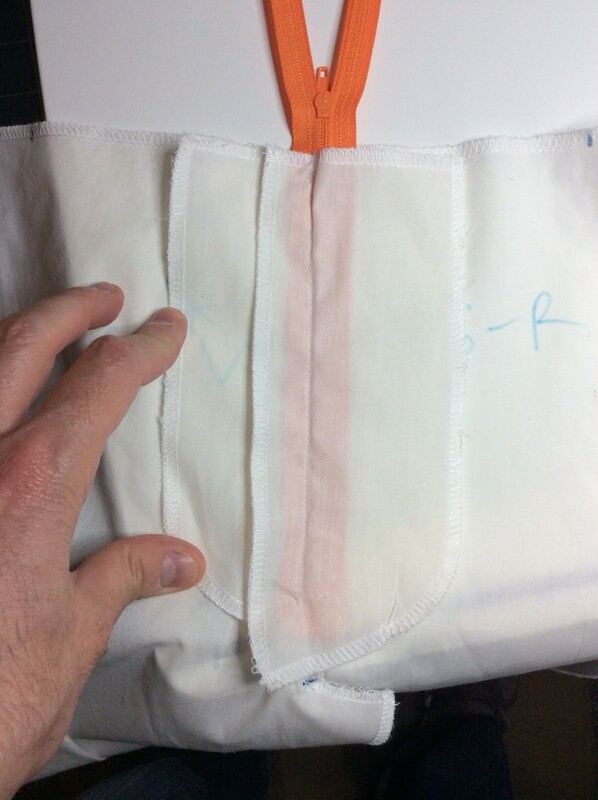 As for the sagging, make sure the top part of the bag extends into the waistband, which will support the bulk of the pocket/bag; make sure to topstitch, in two steps, around the window; and set in a button closure, that will surely close up a sagging welt. Thanks for your perspective on the welts. The welts I made for my wearable muslin have turned out much better, I think due to (a) not being made from muslin fabric and (b) interfacing the welts. But I’m getting ahead of myself. The wearable muslin doesn’t have a button closure for the back pocket, mainly because it lacks a facing. I’m emulating the look of Bonobos Pants, which deliberately leave out the facings so you can intentionally see their pocket bagging. Here’s my work in progress.